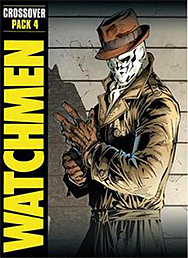 Add the Watchmen Crossover Pack to any DC Comics Deck-Building Game to play as characters from Alan Moore & Dave Gibbons' Legendary graphic novel! Six all-new Super Heroes to play. "Hidden Role" mechanics add suspicion and "who can you trust" elements to the game. All-new Loyalty Cards, Villainous Machinations Cards, Challenge Cards, and Mastermind Plot Cards.